The building of the Sultan Palace Hotel is basically a classic structure in the Empire style, the feature of which is the presence of columns, pilasters, stucco moldings and other classical elements. The facades of the building are decorated with Tuscan, Ionic and Corinthian columns, arched vaults, giving the overall appearance of the building a note of the east. Entrance to the hotel complex and banquet hall is decorated with massive columns, consisting of four Tuscan columns connected together and crowned with a classic pediment and arch vault. These elements are arranged in an orderly manner, with observance of balance and symmetry. 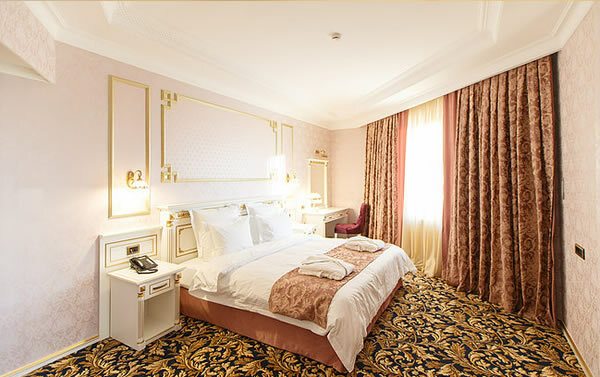 All rooms at the Sultan Palace Hotel are decorated with classic interior elements. All rooms and suites at the Sultan Palace Hotel have a beautiful view of the city skyline. Standard amenities include a minibar, flat-screen satellite TV, a seating area, free tea/coffee making facilities, a safe box, and free Wi-Fi. Each type of room has a cooling and heating system with individual control, as well as a private bathroom. The suites feature a living room and a kitchen with a dining area. 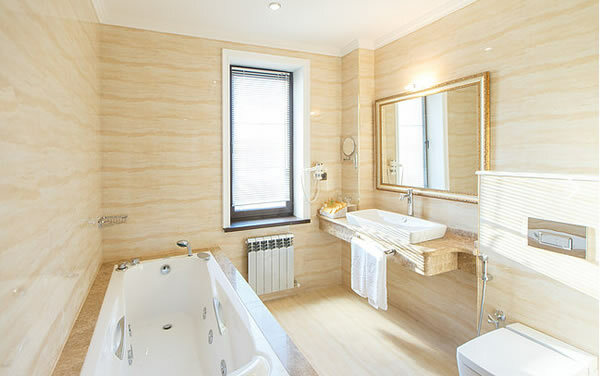 The luxurious marble bathroom includes a bath with hydro massage, bathrobes and exclusive bathroom amenities. Guests are invited to visit the SPA & Wellness Club, which is permeated with the style and spirit of the mystical East. All this – pure luxury, relaxation, atmosphere of peace and bliss. Our specialists know a lot of rituals for body beauty and soul flights. Spa – an oasis of tranquility, where you can find a long-awaited harmony of body, mind and soul. The interior is designed in warm shades that convey the harmony of the sun and the earth and create an ideal atmosphere for relaxation and relaxation. The SPA-care involves all five human senses: hearing, sight, taste, smell, touch. Surrounded by a pleasant semi-darkness, quiet music, magic fragrances, a person completely relaxes, acquires mental equilibrium and physical health, increases vitality, improves efficiency and mood, disappears stiffness in the joints, and in the gait appears previously absent ease. Fitness room is equipped with a line of simulators and equipment of leading Italian manufacturers Technogym. The series of simulators are selected in such a way as to allow the entire body to be loaded. On each muscle, you can choose several simulators, working at different angles, which makes it possible to work them all along the length. For a more energetic workout, the fitness coach will always help you. Professional flooring reduces the burden on the musculoskeletal system and enhances the grip on sports shoes, which allows you to train with comfort and safety. The centralized climate control system allows maintaining the optimum temperature, humidity and fresh air in the hall. After a vigorous workout in the gym with a fitness trainer, you can visit the hammam, sauna, then refresh yourself and swim in the hotel’s indoor swimming pool. The heated swimming pool of the Sultan Palace Hotel has a special magnetism, thanks to the oriental style, the interior is perceived not only as fairy and magical. Oriental style is a real bright mosaic, an incredible kaleidoscope of canons, rules, subtext and characteristics. The pool is equipped with a countercurrent, the worldfamous Endless Pool effect, (translated «endless pool»), allowing to create a flow effect of varying strength. The revolutionary technology of the generator gives rise to the illusion of an endless swim. Thanks to this property, it is possible to not only conduct aerobics and fitness classes, but also training sessions for professional athletes. 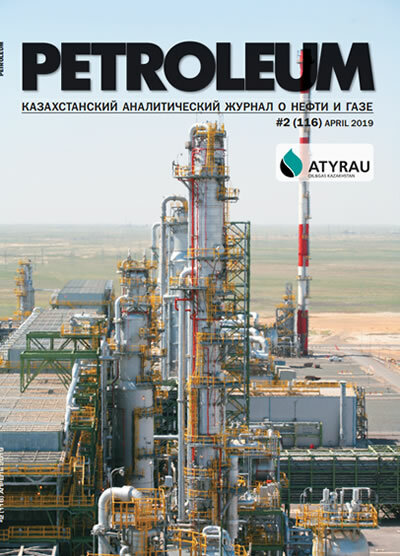 The efficiency of using a multifunctional simulator with an infinite flow is proved by numerous tests. In the restaurant «Sultan Palace» guests can taste a variety of dish­es from various cuisines around the world. Where breakfast, lunch is served daily, and in the evening the system works «Аla Carte». For serving, high-quality porcelain and glassware is used. 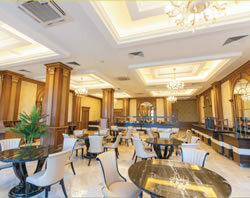 The restaurant is located on the first floor of the hotel complex. Special attention deserves its own confectionery with a wide range of cakes, pastries, pies and other baked goods. The chef of the hotel, constantly expanding the menu and surprises visitors with the style of execution of dishes. You will be pleasantly surprised by the clas­sic interior made of precious wood, stone and furniture made to order. 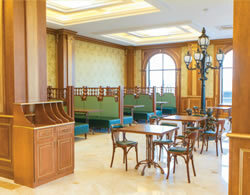 Respectable bar, designed in the classical style, is located in the heart of Sultan Palace Hotel. In this institution, two concepts coexist: Premium Class and Democracy. This symbiosis creates an original and unique place, which will be perceived as a second home. The bar features a wide range of quality alcoholic and non-alco­holic beverages. Over a cup of coffee or a glass of top-quality rare whiskey can informally talk with partners, relax after a busy day or have a cool cocktail at the pleasant sounds of music to start a promising evening. 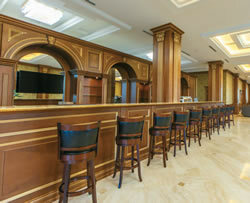 Lobby bar is aimed both at the guests of the hotel, living in it, and at the hotel's visitors. 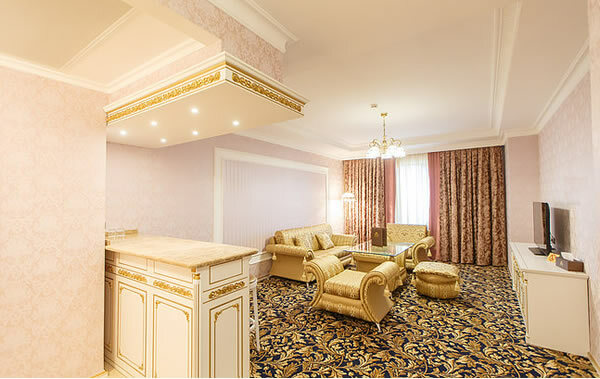 This is one of the most refined and comfortable places of our hotel. Our lobby bar combines luxury of interior, coziness and relaxed atmosphere, which simultaneous­ly has an open friendly conversa­tion, short-term rest for guests, fleeting meetings, and serious business negotiations. 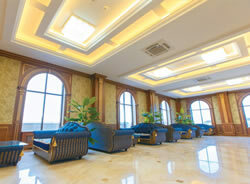 This is a place for waiting, relaxation and comfortable pastime with a Wi-Fi zone. A place where good music plays, where you can watch the broadcast of your favorite TV pro­gram on large TVs, where you can sit very warmly over a cup of fragrant coffee. Irish pub — the same legend as Irish beer. A pub is not only a place to drink, but also a place where you can have lunch or dinner with your family, meet friends and just have a great time. Our interior is made in the best traditions, cozy atmo­sphere, friendly atmosphere, deli­cious cuisine, quality beer, reason­able prices attract new visitors to the pub. The menu offers a wide selec­tion of alcoholic and non-alcoholic beverages. Connoisseurs of this beer can enjoy Irish beer «Guin­ness», Belgian «Hoegaarden» and drinks of other world famous brew­eries. Here you will find dishes of Irish, German and other European countries. 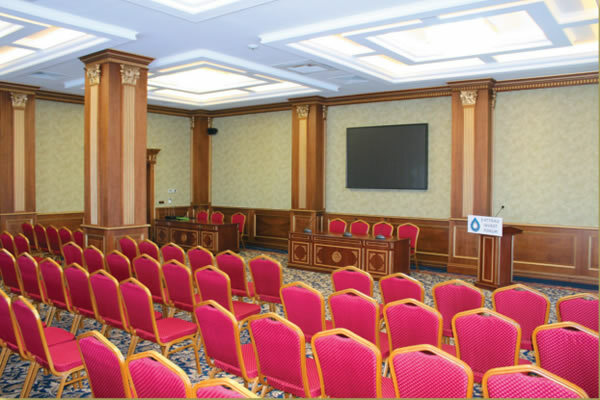 Sultan Palace Hotel provides the opportunity to conduct a variety of corporate events at the highest level. 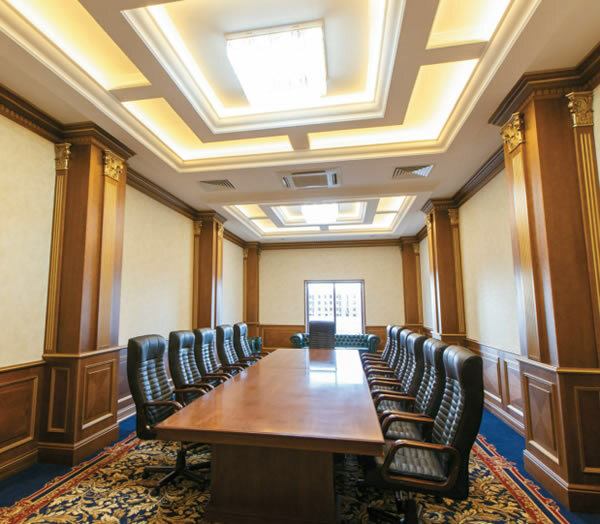 The organization and hold­ing of a conference or negotiations is a responsible business. There are many organizational issues to be addressed. You are freed from all worries related to the event — the hotel specialists will help you resolve issues with the placement organiza­tion, catering, transport, processing facilities. Strictly by the time of the beginning of the event, all seats for participants and speakers will be prepared, and all equipment will be checked and adjusted. Thanks to the presence of the hotel restaurant, we can always offer you an expand­ed menu. The assortment is dis­cussed individually, there are offers for the most demanding taste. For your guests can be offered break­fast. During the break to restore strength will help coffee break, or business lunch. The end of the event can mark the celebratory banquet or a gala dinner. 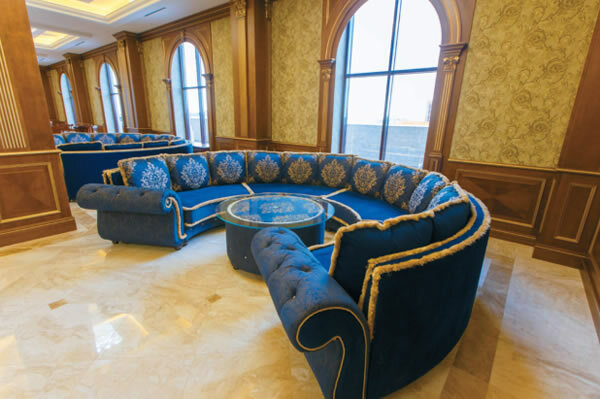 At the hotel complex there is a banquet hall Sultan Palace Ball­room, striking with exquisite clas­sical design with a touch of luxury inherent in the royal style. Thanks to the elegant interior, executed in pleasant eyes bright colors with glossy shades, it is perfectly suitable for any celebrations: from wedding banquets, to festive corporate par­ties, birthdays and anniversaries. The floors of the hall are covered with natural marble, and the walls and ceilings are painted by hand by the best artists of Kazakhstan. This spacious hall allows to place up to 450 people at a banquet and up to 1,000 during the buffet. The beauti­ful hall, equipped with the profes­sional sound system Electro Voice X-line advance, which is the first and only concert venue in Kazakh­stan and American lighting equip­ment, guarantees the performance of a star of the republican and for­eign level with a complex rider. In addition, we have our own backline equipment. Also LED screen, providing online transfer of video, the ability to show clips and videos, and screensaver footage of any complexity. 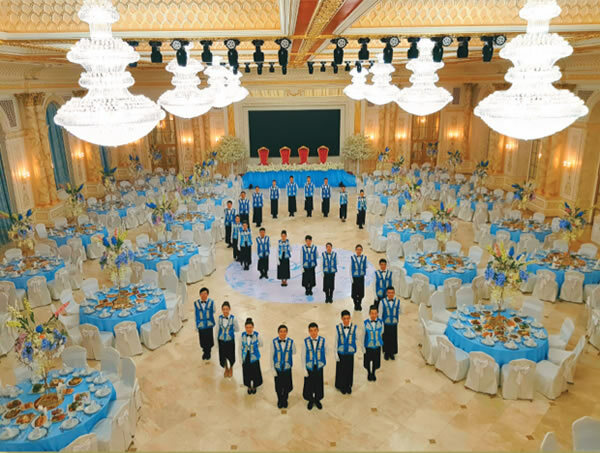 The team of experienced professionals is ready to do everything to make the holiday in Sultan Palace Ballroom unforgettable: exquisite dishes from different directions of the cuisine in accordance with the choice of the client, as well as excellent service and organization of the event — will make your guests remember the wonderful evening spent in Sultan Palace Ballroom.